Here's another classic Perini sailing yacht on the market as I learn that Yachtzoo has signed the 48.12m Corelia for sale. 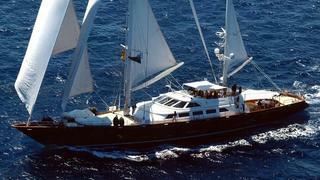 Ketch rigged, she was built by Perini Navi in 1993 to ABS class and refitted in 2000. Accommodation is for eight guests in four cabins including a full width owner's suite and three double staterooms, while twin 750hp MTU engines give Corelia a cruising speed of 13 knots. Lying in Athens, Corelia is asking €17.25 million.